The ND 1200R RADIAL DRILL digital readout is an easily operated, powerful readout for conventional and fast radial drilling machines. Machine movement is measured by a linear encoder on the radial arm and a rotary encoder or a friction wheel system on the column. An additional encoder on the quill can also be used to measure and display the drilling depth. 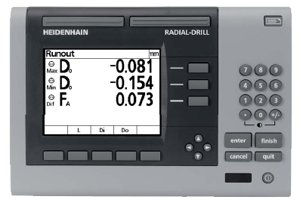 The ND 1200R RADIAL DRILL digital readout has a monochrome flat-panel screen for displayed values, dialogs and inputs, graphics functions and soft keys. The robust, diecast aluminium enclosure meets the demands of the shop floor environment. With the ND 1200R digital readout you can switch at any time between display in polar coordinates (radius R, angle a) and Cartesian co-ordinates (X,Y). With the aid of the probing functions you will find the workpiece datum and orientation faster. One essential working aid is the function for positioning with the distance-to-go display. You enter the nominal position (i.e. the drilling coordinates) as X,Y values and the RADIAL-DRILL digital readout shows you the distance remaining to the target position as separate values for the angular and radial axes. The ND1200R automatically calculates the positions when machining hole patterns such as bolt-hole circles (full circle of circle segment) and linear hole patterns, matrices or frames. The programming function of the ND 1200R supports you when machining recurring workpieces and machining patterns. The RS-232-C/V.24 serial interface for saving programs and updating software.